Francine's Friends: Press Conference Set for Friday, August 19th at 10:00 a.m.
Press Conference Set for Friday, August 19th at 10:00 a.m.
All media is invited to attend the Francine's Friends Mobile Mammography press conference on Friday, August 19th at 10:00 a.m. at Debrand Fine Chocolates, 10105 Auburn Park Drive, Fort Wayne, IN 46825. Francine's Friends will be kicking off a grassroots capital campaign "$50k in 50 Days" and also sharing exciting news for plans to purchase a new coach for the mobile mammography initiative, including current supporters to date. Francine’s Friends, an all-volunteer 501c3 nonprofit who founded the mobile mammography initiative and purchased the original coach, has committed to purchasing the new coach and has been quietly raising funds to do so. True to the spirit of their name sake, Francine Schubert, who always met challenges with enthusiasm and determination, campaign leaders and the board is excited to share updates about the "quiet phase" of the campaign and funding status. Those invited and represented at the press conference include Francine Friends board members, community partner representatives from Parkview Health and Breast Diagnostics Center, English, Bonter Mitchell Foundation, PHP Foundation, Radiation Oncology Associates, Indiana Surgical Specialists, Steel Dynamics Foundation, Mary Cross Tippmann Foundation, Wilson Family Foundation, Journal Gazette Foundation, Waterfield Foundation, Howard P. Arnold Foundation and Dr. John Crawford. 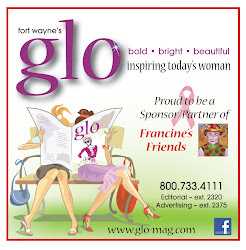 Francine's Friends, whose mission is to make early detection of breast cancer available to every woman in Fort Wayne and the surrounding counties, has provided screening mammography for over 16,000 women since its inception in 2005. For more information, or to view the mobile mammography schedule, visit the website at FrancinesFriends.org.